Cast members of “You Can’t Take It With You” at Sound Theatre Company. 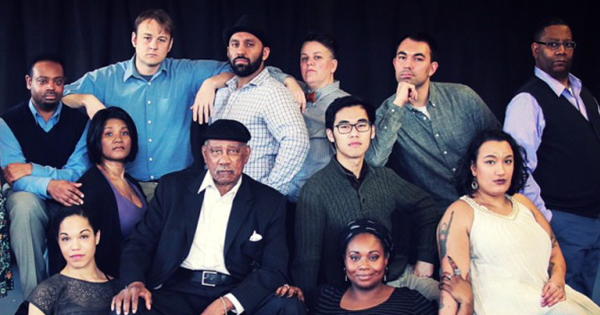 From left to right: Corey Spruill, Ayo Tushinde, Laura Steele, Chris Shea, Tee Dennard, Gurvinder Singh, Laurie Lynch, Aaron Jin, Shermona Mitchell, Andrew Weiss, Neve Mazique and Bob Williams. One in five Americans identifies as having a disability and they span all ethnicities, genders, and ages. And according to the Center for Disease Control (CDC) disability is even more common in women (1 in 4) and minorities (3 in 10). So where are their stories? This season, you’ll find them at Sound Theatre Company in Seattle, WA. 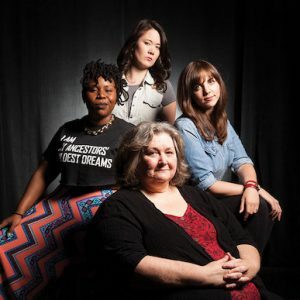 Sound Theatre’s 2018 season is called The Human Family: Toward A Radical Inclusion, and features artists living with disability. They will present the comedy classic, You Can’t Take It With You with an inclusive cast, an ASL version of Midsummer Night’s Dream, and the world premiere of Rules of Charity, a play about the relationship between a wheelchair-bound father with cerebral palsy and his caretaker daughter. The company is also offering their Making Waves program, which includes a series of readings of plays by disabled playwrights, art exhibitions, accessible performances and other experimental works. All programming will be made accessible for audience members with disabilities. 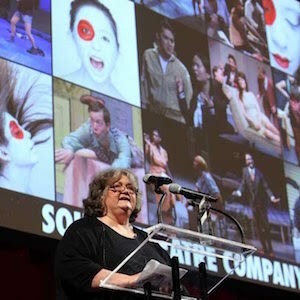 Teresa Thuman accepting a Gregory Award for Theatre of the Year on behalf of Sound Theatre Company. Sound Theatre Company is not alone in their quest to reframe disability on and off stage. On March 1, 2018 Roundabout Theatre opens their production of Amy and the Orphans, a new play by Lindsey Ferrentino, which stars Jamie Brewer, an actress who has Down syndrome. Brewer and her understudy Edward Barbanell are the only known performers with Down syndrome to play the lead in an Off-Broadway or Broadway theater production. In 2015 Mixed Blood Theatre founded the Disability Visibility Project, and solicited forty theatre professionals to share plays that they feel best speak to disability in two ways: plays with theme or content on disability and/or plays with characters with disabilities. Other theaters that are inspiring audiences to re-envision disability through professional theatre include theaters like Phamaly Theatre Company, Deaf West, Phame, Apothetae, Identity Theater, Wry Crips, InterAct Center for the Visual and Performing Arts, Theatre Breaking Through Barriers, That Uppity Theatre Company’s Disability Project, and Nicu’s Spoon Theatre Company. Sound Theatre’s first offering in their new season is “You Can’t Take It With You”, Directed by Teresa Thuman and Assisted by Sadiqua Iman. It runs February 24 – March 11, 2018 at Center Theatre at the Seattle Center Armory. For more information, visit www.soundtheatrecompany.org. National Arts & Disability Center (NADC) The mission of the NADC is to promote the full inclusion of audiences and artists with disabilities into all facets of the arts community. Alliance for Inclusion in the Arts is a nonprofit that promotes full diversity in theatre, film, and television. They focus on authentic dialogue about race, culture, and disability that embraces the complexity of underlying social and historical issues. Formerly called the Nontraditional Casting Project, they have a disability advocate on staff. This entry was posted in Arts & Social Justice, Theatre on February 26, 2018 by Sarah Greenman.